It was a busy year for materials handling in Australasia, with two major trade shows, new model launches, fleet expansions and dealer developments. Here are some of the highlights of 2018. At the beginning of the year, Kalmar signed an agreement to acquire the port services business of Inver Engineering in Australia. The investment was part of Kalmar's strategic aim to grow in services by strengthening and broadening the company's existing service capabilities throughout Australia, New Zealand and the Pacific. New South Wales-headquartered Ranger Lifting opened a new facility in Melbourne to meet ongoing demand for its products and services, principally from the city's thriving construction sector. The Melbourne branch is located in Kensington, northwest of the central business district. Industry veteran Ian Jongen joined the company in the role of Victorian state manager to head up the new operation. Hylton Taylor, Philip Cardaci and Matt King (JCB) with Brad and Terry Michaels from Michaels Group. 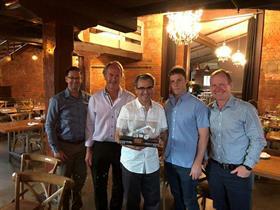 JCB Construction Equipment Australia sold its 10,000th JCB machine in Australia through its dealer, the Michaels Group. JCB CEA has been selling JCB agricultural and construction equipment for almost 20 years. There are now five JCB CEA branches and 60 dealer outlets throughout Australia. The end of the month was marked by Toyota topping the Australian forklift market for the ninth consecutive year, achieving an average marketshare of nearly 40%. Official Australian Industrial Truck Association (AITA) industry sales results showed Toyota Material Handling Australia (TMHA) delivered over 5,100 forklifts in calendar year 2017, an increase of approximately 400 units on the previous year. Australian port solution provider Qube Ports opted for a new Liebherr mobile harbour crane type LHM 420. The new machine is the eighth mobile harbour crane Qube Ports has purchased from German crane manufacturer Liebherr. 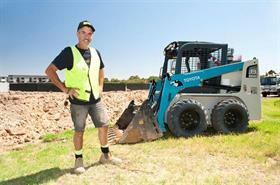 In February, a leading West Australian waste collection and disposal service, Steann, based in Nedlands, added a Toyota Huski 5SDK9 skid-steer loader to its fleet, the largest loader it has purchased. Steann has used Toyota Huski loaders since 2002, with a 3SDK8 model, and currently has several 4SDK8 loaders still in regular use after 10,000 hours' service. Height 4 Hire celebrated its 500th machine with a custom-painted pink machine to raise funds for the McGrath Foundation. The new Compact 14 scissor lift was supplied at cost by Haulotte, in support of the McGrath Foundation's mission to raise money to place specialist McGrath Breast Care Nurses. NTP Forklifts Australia opened its new Huntingwood, NSW premises on 14 February. Managing director Damien Garvey said the investment in the new facility "demonstrates our company's future commitment to our staff, the NSW market and, more importantly, to our growing customer base". Moose Toys added Linde reach trucks to an operation which already relied on Linde electric forklifts. The company has grown from a niche local toy manufacturer to a global toy power house in less than two decades, dominating in categories including collectables, craft, dolls, games and youth electronics. Linde, which has supplied forklifts to the company since 2006, was asked to make recommendations, along with two other alternative suppliers. All three provided reach trucks for Moose Toys' operators to trial. In March, SafeWork NSW ran a week-long forklift safety blitz after three workers were killed and more than 1,300 were injured in two years. Frank Blasi with his Toyota Huski 5SDK-8 skid-steer loader. Also in March, Frank Blasi of Balwyn-based FBI Excavations Pty Ltd clocked up more than 33,000 hours in his 10 Huski loaders over 32 years. He bought his first Toyota Huski (a 2SDK8) in 1986 and has used them exclusively ever since, including his latest 650 kg operating-load 5SDK8 machine, commissioned in December 2017. Ahern Australia, the sales and service provider for Snorkel lifts and Xtreme Manufacturing telehandlers in Australia, was appointed as the exclusive distributor for RUTHMANN BLUELIFT tracked spider lifts. BLUELIFT was an Italian spider lift manufacturer which was founded by the Marti family in 2004. In 2016, it was acquired by RUTHMANN Group. In late March, an Esperance transport company was fined $58,000 after a worker's hand was crushed between two containers while he used a forklift without a proper licence. According to WAtoday, Cranes Haulage was fined in Esperance Magistrates Court over an incident in 2014. Forkliftaction News also featured Ruth Currey, aged 76, who was reported to be Australia's oldest forklift driver. According to the Wauchope Gazette, the well-known Wauchope resident has been an employee with the Hastings Co-operative Ltd for close to 40 years. In April, Lencrow Group brought all its operating companies together under a single name. Allforks Hire, Profork and Hi-Lift Materials Handling all came under the Lencrow Forklifts banner on April 1 and director Ross Grassick said the new Lencrow Forklifts operation would continue to be Australia's largest independent forklift supplier, with a staff of more than 100, a growing order book, and a client list that includes many customers who have been dealing with Lencrow Group companies for more than 30 years. JCB Construction Equipment Australia (CEA) brought the smallest telehandler in the JCB range, the 516-40, to Australia. JCB CEA national product manager (Telehandlers) Anthony Lockwood said the versatile machine benefits from its offset single-spine chassis which "wraps around the cab, meaning the cab can be mounted lower than normal". The Port Pack facility at Napier Port on Hawke Bay in New Zealand's North Island took delivery of seven Linde 396 series H80D 8 T forklifts. These forklifts handle one pulp pack at a time, creating stockpiles of pulp packs which, in turn, are packed into containers by Linde 394 series 4.5 T diesel forklifts, fitted with single pack pulp clamps. Cascade Australia appointed Rob Whitmore to the newly created role of manager, strategic development- customers and product. Whitmore rejoined Cascade in 2008 as the national sales manager, focusing on dealer relationships, national sales opportunities and managing the sales team. National forklift distributor Toyota Material Handling Australia (TMHA) celebrated 50 years of Toyota forklift sales in Australia with a gala function in Sydney on April 5. Toyota sold its first forklift in Australia in 1968 and now holds almost 40% of the Australian market. Hyster-Yale demonstrated the first hydrogen-powered forklift in Australia, showing a Hyster 1.8 "powered by Nuvera" unit at Hyundai's Macquarie Park head office in Sydney. The Hyundai site was chosen because of its hydrogen refuelling station, currently being used for the carmaker's local hydrogen vehicle testing. Hyster-Yale Asia Pacific managing director Tony Fagg said the new hydrogen-powered forklifts were aimed at "companies seeking the ultimate combination of environmentally harmonious indoor and outdoor performance, without having to interrupt production cycles or have vehicles out of service for lengthy charging or battery changing". In May, New Zealand-based BISON launched a new, automated container lift solution that is capturing the attention of importers and exporters around the world. "The C-Lift A32 is a game-changer for shippers wanting to work with grounded containers," said BISON CEO Greg Fahey. "Currently, these companies have to invest a lot of money in on-site handling equipment, or bear the cost and limitations of a third-party lift service - assuming one is available in the area." In May, beverage giant Coca-Cola Amatil selected Swisslog's fully automated robot-based order picking system, ACPaQ, as part of the automation and major expansion of its Auckland distribution centre. The ACPaQ technology to be installed in Auckland this year combines robotics solutions for palletising and depalletising with Swisslog's CycloneCarrier shuttle technology to create a fully automated process that facilitates high throughput and reliable picking of orders for logistics, distribution, food and beverage, and retail applications. Toyota Material Handling Australia (TMHA) inducted a record 13 apprentice forklift technicians in its annual intake, ensuring a solid skills support base for the future. The apprentices were chosen from 878 applications from around the country, a 75% increase on the 2017 figure. In a forklift accident, a 40-year-old man was injured at a Dudley Park, South Australia business. According to The Advertiser, the man was taken to the Royal Adelaide Hospital in a stable condition after being crushed between a forklift and light truck. Meanwhile, Worksafe Queensland investigated a Burleigh business after a pedestrian was hit by a forklift. Queensland Police impounded a warehouse forklift that struck and ran over the man at the USG Boral site on Junction Road. It is believed the victim suffered injuries to his head, back, shoulder and ankle and was transported to Gold Coast University Hospital. 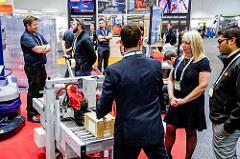 The megaTRANS trade show was held in Melbourne in May, attracting half a dozen materials handling suppliers among almost 200 exhibitors. Supported by leading industry bodies including the Australian Logistics Council, SCLAA, ICHCA Australia, NTC Australia and the Victorian Transport Association, among others, the event ran for three days at the Melbourne Convention & Exhibition Centre. Forkliftaction was among the media partners. ACFS e-Solutions, part of Australian Container Freight Services (ACFS), Australia's largest privately owned container logistics operator, worked with Dematic, a leading global supplier of integrated automated technology, software and services, to implement a complete warehouse mobility solution at two facilities in Pemulwuy, NSW and Derrimut in Victoria. In June, Toyota Material Handling Australia (TMHA) further expanded its product range with the Huski SV-E Skytower range of compact, self-propelled scissor lift work platforms. TMHA launched five new Huski scissor lift models at the Hire18 show in the Brisbane Convention and Exhibition Centre. Also in June, automated technology supplier Dematic successfully installed automated guided vehicles (AGVs), designed specifically for 24/7 outdoor use, at aluminium smelter Bell Bay Aluminium. The company previously faced numerous challenges around hiring workers for a 24-hour shift in its outdoor yard which was exposed to variable and harsh weather conditions. The use of AGVs instead of human-operated forklifts increased safety at Bell Bay Aluminium by reducing the amount of time workers are near heavy aluminium ingots, and sensors on the AGVs ensure they can safely operate around workers and other vehicles. One of Australia's fastest-growing battery companies sourced equipment from Toyota Material Handling Australia (TMHA) as it expanded. R & J Batteries' new distribution centre at Truganina in Melbourne's west commissioned a new Toyota forklift and racking for 2,000 pallet spaces. In July, Rock Logistics ordered 26 remote-controlled loader cranes for its delivery contract for roofing products manufacturer Lysaght, a division of BlueScope Steel, for its operations in Victoria and Tasmania.The order, worth approximately $1.5 million, was for 13 HIAB X-HiDuo 138 mid-range cranes and 13 XS 099 HiDuos for delivery in Q3 2018. Toyota Material Handling Australia's Master Technician of the Year award for 2018 was won by TMHA Brisbane's Luke Kuschert, after also winning 2018 National Technician of the Year award for Raymond products. Kuschert was also crowned Master Technician of the Year in 2016 and 2016 National Technician of the Year for BT products. The annual competition saw 160 forklift technicians and apprentices from across the TMHA national branch network complete two online exams, the first whittling the field to 68 and the second determining 15 finalists. 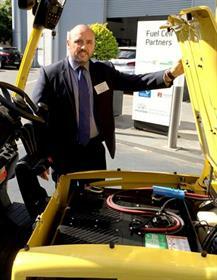 United Forklift and Access Solutions introduced a new electric forklift range to Australasia. The electric range included C-Series pallet trucks to replace manual hand pallets, A-Series Walkie Stackers and T-Series Walkie Reach Stackers. New Zealand's Scott Technology acquired the assets and intellectual property of Transbotics, a US-based AGV manufacturer headquartered in Charlotte, North Carolina. "This strategic acquisition will achieve our goal of building a complete end-to-end offering for the overall production process from raw material receipt to final distribution," said managing director Chris Hopkins. Australian rental company Kennards Hire added JCB's 525-60C telehandlers to its fleet. The company didn't disclose the number of machines that it was planning to take, but were looking for sufficient inventory to cover its 170-branch network across Australia and New Zealand. In July, WorkSafe investigated an incident involving a crane damaged by high winds at a construction site in Lennox Street, near Bridge Road in Richmond. Emergency services established an exclusion zone around the area while damage to the crane was being assessed. CeMAT panel: Philip Graham (Combilift), Jason Mair (SICK), Allan Leibowitz (Forkliftaction News), Pas Tomasiello (Dematic) and Rob Whitmore (Cascade). CeMAT Australia wrapped up another edition in Melbourne in July, with a small materials handling presence in a show increasingly dominated by warehousing and logistics. Organisers proclaimed the event a success, confirming an attendance of "over 2,500 renowned industry leaders and delegates" during the three-day event - up from 1,789 visitors in 2016. While many big-name forklift brands were absent, there were a few new brands on show, all of them Chinese. The exhibition was accompanied by an extensive presentation program in the Knowledge Theatre. Forkliftaction News editor Allan Leibowitz facilitated a panel discussion on technology and the future of warehousing and materials handling. In August, Terex Cranes ramped up pick & carry crane production at its Brisbane location to keep up with the needs of its customers. Terex delivered 15 new pick & carry cranes in June; 13 units went to customers in Australia, one was delivered to a customer in Brazil and another to a customer in South Africa. Kalmar won an order to provide mobile equipment to Australian Container Freight Services (ACFS) operations in Adelaide, Fremantle and Melbourne. The order comprised three DCG100 empty container handlers and two DRG450 reachstackers. In September, TMHA showed off a uniquely modified Toyota 8-Series 1.8 T payload forklift which allowed Glen Dimplex factory hand Shaun O'Bryan to carry out an increased range of duties at the business' warehouse in Dry Creek, north of Adelaide. O'Bryan, who has dwarfism, was placed in employment with Glen Dimplex by specialist Disability Employment Service provider Barkuma in 2012. Starting as a factory labourer, he gradually acquired new skills and responsibilities on the job, most recently culminating in a desire to get his forklift licence. Barkuma is a not-for-profit organisation that helps people with developmental disabilities gain employment in the open workforce and provides ongoing support. The advertising watchdog banned a Sydney Forklift Trucks' transport ad for exploiting and sexualising women. Located on the back of a truck, the ad featured a painting of a naked woman with her breast exposed, according to Mumbrella. Also in September, Australia's largest privately owned container logistics group, ACFS, enhanced its productivity and cost-efficiency for customers through a fleet of Hyster materials handling equipment deployed across its five mainland Australian sites. ACFS has built up a fleet of more than 40 Hyster lift trucks through Australian dealer Adaptalift Group - including warehouse trucks of 1.8-5 T and reachstackers capable of handling loads over 60 T - to grow its business rapidly to exceed 1.2 million TEUs a year. Haulotte completed the delivery of over 400 machines valued at over $7 million to Coates Hire. The machines, including 350 Optimum 8AC and 36 Compact DX scissor lifts, as well as 20 HA16 RTJ PRO articulating booms, will be used across Australia to fulfil Coates Hire rental requirements for the near term. The order was Haulotte's most significant to date with Coates Hire, as the global manufacturer marks several successful years of growth in the Australian market. WorkSafe Victoria was verifying safety checks on more than 60 Raimondi cranes, as investigations into a tragic incident at Box Hill continued. Clark Cranes, which owns and sells Raimondi cranes, had inspected the hoist rope termination assembly, also known as the wedge socket, on all but one of the Raimondi cranes in service in Victoria. All checked cranes were returned to service. Container handler maker Mobicon added a low-profile straddle carrier designed to stack containers two high and to travel under awnings and through low door openings. Jesse Schultz, Mobicon general manager, said the new model uses hydraulic lifting only, and avoids the use of potentially dangerous and unsafe wire ropes and sheaves, "making the Mobicon extremely low maintenance and safe". The Toll Group opened a new highly automated distribution centre to meet increasing demands from its customers for efficient e-commerce and omnichannel order fulfillment. The logistics company features several Dematic solutions integrated with best-in-class technologies at the new centre. A Warrnambool abattoir was charged by WorkSafe Victoria following an incident in which a forklift ran into two people in October last year. Midfield Meat International Pty Ltd was charged with contravening sections 21 and 23 of the OHS Act for failing to eliminate or reduce, as far as reasonably practicable, the risks of forklifts colliding with pedestrians. In October, warehousing and distribution company Cardinal Logistics was fined NZ$354,375 after a former worker was crushed against racking by a forklift, resulting in a 35-day stay in hospital after he suffered multiple fractures. WorkSafe found that while Cardinal had an effective traffic management system and appropriate controls for separating pedestrians and forklifts, the system had not been implemented at its Islington warehouse. The worker's leg had to be amputated. 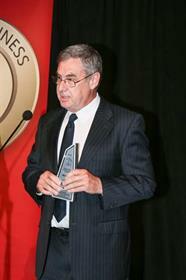 He was awarded reparations of NZ$29,967 in addition to a voluntary payment of NZ$56,000 prior to sentencing. Dematic was chosen to install its Automated Multishuttle Chilled and Frozen Storage and Retrieval System (ASRS) in the Colac, Victoria meat processing facility of the Australian Lamb Company (ALC). One of Australia's leading producers of lamb, ALC produces, supplies and exports lamb products to hotels, resorts, restaurants, butchers and supermarket chains worldwide. The Dematic solution was chosen because it met key requirements set out by the consultant engineer, NIRAS, who determined the design of ALC's wider upgrade project and also managed the tender process. In November, Toyota Material Handling Australia (TMHA) put the first Toyota hydrogen fuel cell-powered forklifts outside of Japan into action during trials at Toyota Motor Corporation Australia's parts centre located at its former manufacturing plant at Altona, Victoria. TMHA general manager - corporate compliance and project development Bob Walmsley said the hydrogen FC forklifts take around three minutes to fill the hydrogen tank, compared with around eight hours to recharge a conventional battery. "This means we can use these forklifts more often, without having to significantly wait between charges or use second-shift batteries to achieve the same utilisation." Ports of Auckland signed a software service level agreement (SLA) with Konecranes covering its new automated straddle carriers as it prepared for expansion. The equipment covered by the software service level agreement includes 27 new Konecranes Noell Automated Straddle Carriers (A-STRADs) and 21 retrofits to manually operated Konecranes Noell straddle carriers that would make them fully automated. Andrea Artoni (AlmaCrawler) and David Maxwell (United) celebrate the new retailer agreement. 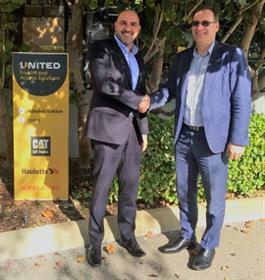 United Forklift and Access Solutions was selected as the exclusive Australian dealer for Italian scissor lift company AlmaCrawler. United now offers the Athena bi-levelling tracked scissor lift and future products. As the year's end approached, Ports of Auckland committed to build a hydrogen production and refuelling facility at its Waitema port. The company, and project partners Auckland Council, Auckland Transport and KiwiRail, will invest in hydrogen fuel cell vehicles including port equipment, buses and cars as part of the project. Workcover launched an investigation after a man was killed in a workplace accident in the Sydney suburb of Banksmeadow in early December. The 35-year-old was killed when a truck reversed into a forklift inside a business. He died at the scene, according to an ambulance spokesman. Online driver training provider DT Driver Training was acquired by TR Group to sit alongside its Master Drive Services brand, adding further options for both light and heavy vehicle training. Neil Bretherton, general manager strategic development at TR Group, said the aim was to provide a broader service to its heavy vehicle clients as well as strengthening the company's focus on technology and learning. Equipment hire firm Coates Hire took delivery of 10 new Manitou 160ATJ+ elevating work platforms. The 160ATJ+ is the only 45 ft. (13.7 m) elevating work platform on the Australian market with a capacity of 400 kg, some 75% higher than a standard 45 ft. elevating work platform. Coates Hire placed an order for a further 31 high-capacity Manitou access platforms to be delivered in 2019 on top of the 10 units previously delivered, which will bring their total Manitou access fleet to over 80 units in Australia. And finally, we featured Jeff Hancox who, by day, drives a forklift at Peanut Company of Australia in Kingaroy. He'll be competing against some of the best impersonators in the world in the Ultimate Elvis Tribute Artist competition which is part of the annual Parkes Elvis Festival from January 9 to 13. Full-time forklift operator Hancox is a huge Elvis Presley fan who enjoys sharing his love of his idol's music with an audience, entertaining people at his local clubs, pubs and private functions.